If you walk around the Forum, you can find characteristic traces of Ostia’s latest business: The marble recycling industry (you can easily turn this search into a fascinating detective game for the whole family, if they are bored from their traditional guide-books…). 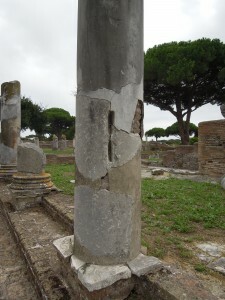 Characteristic marks of destruction can be seen at some columns (see pictures below), which were all re-erected by the former excavator Guido Calza and his successors in the attempt to raise the attractivity of the site for tourism. Guido Calza himself did not understand the scientific necessity of documenting the original find-positions of the columns, but thanks to the written comments of his assistant, Raffaele Finelli, regarding the involved construction companies and the old excavation-photos, it is partly possible to reconstruct lost information about find-spots, find-circumstances and – also an integral part of archaeology „inside“ archaeology – the modern reuse history of ancient objects. The carefully cut holes with almost parallel chisel marks in the columns are characteristic for a certain work-process. Several of these holes set in a straight line allow the break of a column in two regular shaped half-columns, more or less exactly along the line. 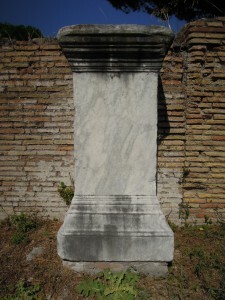 Rows of similar holes can be observed on monuments from the Forum Romanum in Rome as well (at the so-called Stilicho-base and other monuments around the curia). The columns and monuments mentioned above have in common that they were cut into regularely shaped marble blocks, ready for reuse. The „products“ of this quite regular breaking-process could be found on our marble pile, TDV (see pictures below). Number 157b of the pile (see pictures above) is half a column, which was cut into more manageable fragments (compare the column’s surface details). 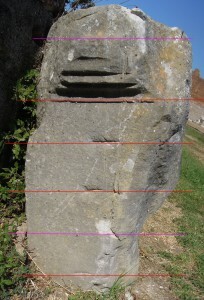 A similar surface-treatment can also be observed at a half-cut statue (see picture below. For the statue, see chapter 2). In both cases, the re-working process seems to have been interrupted by unknown circumstances. But again, thanks to this interruption, the fragments are at least preserved! One fragment from the 1923 excavations provides a hint for the dating of these recycling activities. 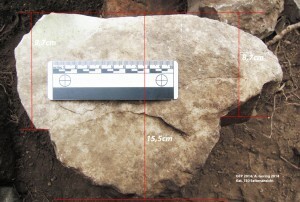 A rectangular stone was cut out of an architrave (see picture below). You can see the same cutting-marks („chisel-lines“) inside the holes of the column, which was ready to be broken up. The cutting work on the architrave was executed very carefully. One could therefore doubt that the purpose only would have been to get random fragments for lime kilns. 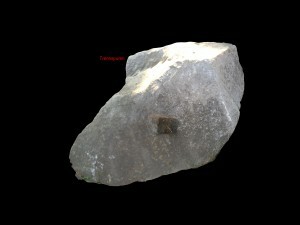 The rectangular cut-out fragment does not seem to have been preserved, but some characteristics of the profile seem to provide further hints. 1.) The architrave belongs to another architrave (see picture below), which was – due to its inscription – dedicated by Vincentius Ragonius Celsus, Prefect of the grain supply (annona) as late as 385-389 AD: Thus, we have a clear terminus post quem (TPQ) of its demolition for intended reuse. 2.) The architrave wouldn’t have been reused immediately after its building. The monument had obviously already collapsed before recycling was intended. That means, it was not demolished intentionally, but it is much more probable that the recycling was a side-effect of collapse due to external factors. Regarding its original function as an architrave of a „fountain room“ close to its modern find-spot (see NDF), we expect the major earthquake of the middle of the 5th century AD to have been a „catalysator“ for the reuse, as it is verified for many other nearby buildings and monuments of the Forum by stratigraphic evidence (see former campaigns regarding the porticoes MFW, MFP, and the MFR). The fountain room was not rebuilt after ist collapse in 442/443 AD, so its architectural decoration was free to be reused (maybe recycling workshops could buy licenses regarding certain areas to take the material. This idea is due to the fact that „our“ workshop MFD/TDV is located not far from the fountain room NDF). 1.) In the attempt to get marble blocks, especially marble slabs, which were needed in Late Antiquity for the maintenance of public buildings, baths, fountains, toilets a. s. o. as necessary as for the new building-sites for luxurious private houses and villas. Marble slabs for pavements or walls were almost constantly needed for new building-activities or repairs after every collapse catastrophy (due to fires a. s. o. ), when collapsed ceilings had destroyed the former floors and wall decorations. 2.) 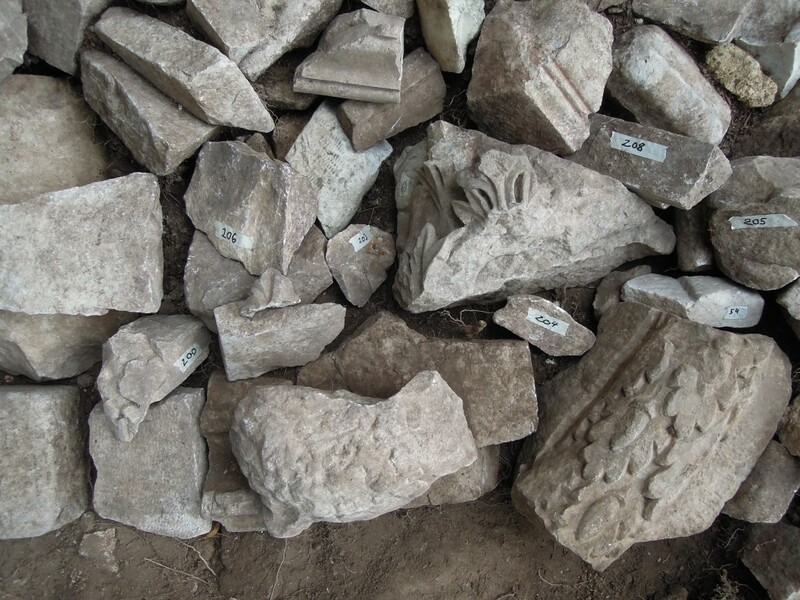 In the attempt to get specific elements for late marble decorations as for example the profiles we have found in numerous examples in our pile (see picture below). 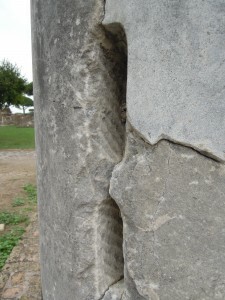 The same cutting-marks, as seen on the columns or the architrave of Ragonius, can also be found on the cella blocks from the Roma and Augustus temple (see picture below). They had obviously been ideal for being reused and reworked either to late antique „spolia“-slabs or for different shaped architectural elements. To gain marble-profiles, mostly for the luxurious decoration of late antique houses or fountains, a large number of late antique statue-bases were obviously also cut into pieces (one of the few preserved examples can be seen on the picture below to the right). 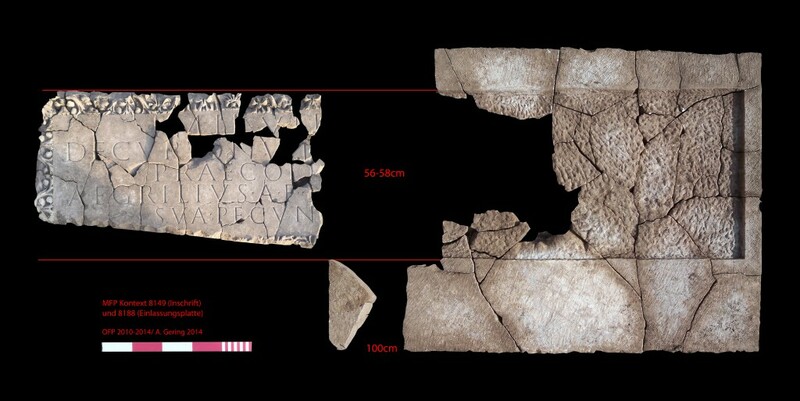 This theory is verified by the rather late stylistic dating of many fragments with architectural decoration, which had been re-cut in our proposed workshop and were found in our piles in TDV and MFD (compare example above). This could be a good explanation for the fact that hardly any statue-bases of the Forum had survived. 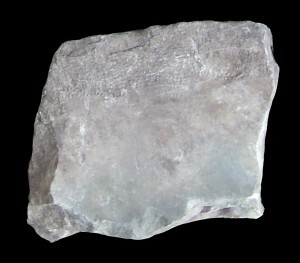 With a closer look to the surfaces of the stone, many of the intended cutting-lines can still be seen. In some cases, the cutting-process to produce pavement slabs was interrupted or abandoned due to unknown circumstances: Maybe the blocks broke irregularely during the reworking process (for a good example, found by us in 2011, see pictures below). 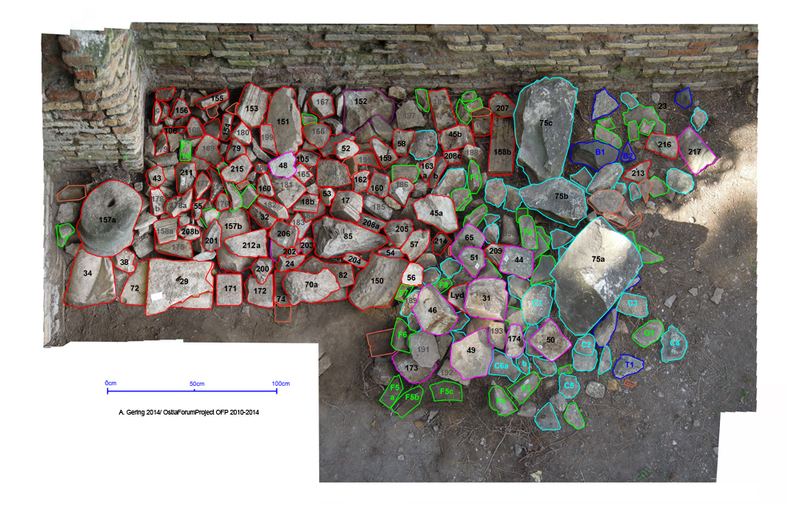 After some statistical research in our post-excavation work, we have the impression that the dimensions of the cut-out blocks resemble „standard sizes“ for reuse (half a Roman foot or one Roman foot a. s. o.). 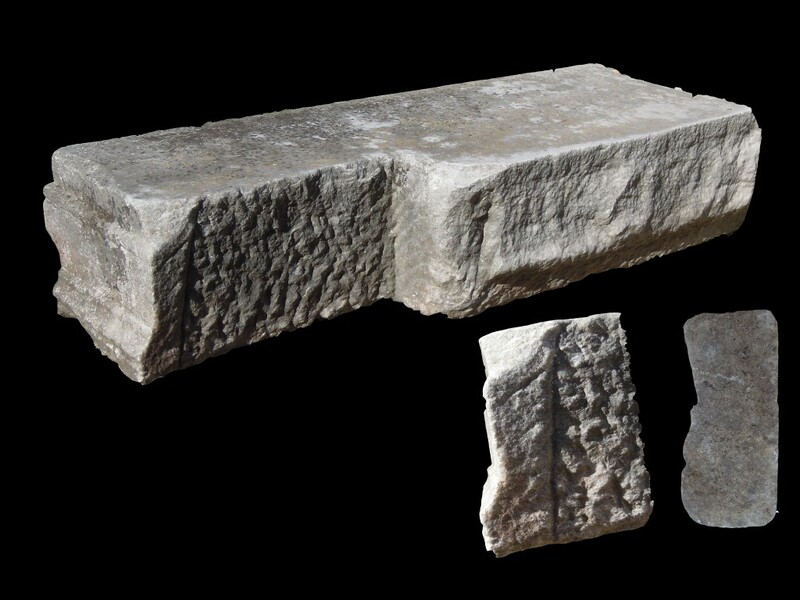 Blocks with these dimensions can easily be divided for late antique pavement slabs, which are usually 6-8 cm thick (see picture below to the left: Big pavement slab with marks of a stone saw. 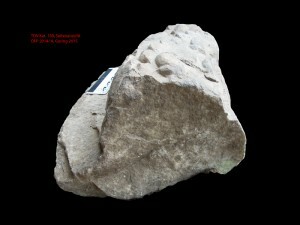 Picture to the right: Chisel-marks indicating, where to cut the stone into roughly 6-8 cm thick slabs). 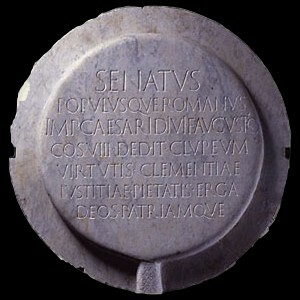 Similar block-sizes of 15 or 30 cm thickness, as the ones from Ragonius‘ inscription-architrave, were cut out of other marble-objects as the statue-base, which can be found in front of MFD (see picture below to the left. 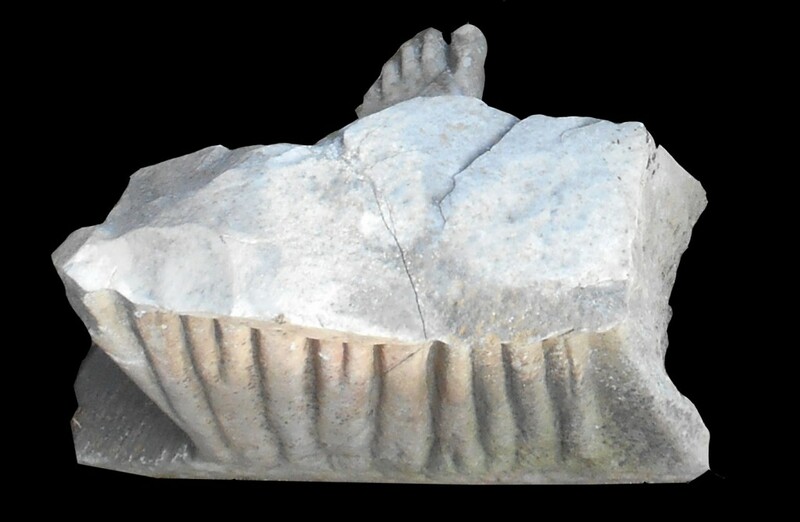 The find-position resembles probably their last reuse in the nearby workshop). 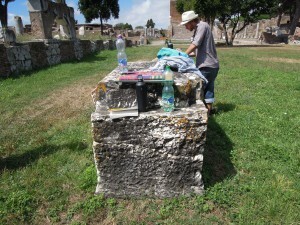 An exact parallel for intended or half-finished cutting-processes can be found at another statue-base – the back-side of the famous equestrian monument of Man(i)lius Rusticianus (see picture below to the right), a praetorian Prefect from Maxentian times, who had the problem that many of his monuments were almost instantly reused after his career had ended under Constantine (compare the base we found in the stylobate of one of the porticoes of the Foro della Statua Eroica, FSE: See Inscriptions). 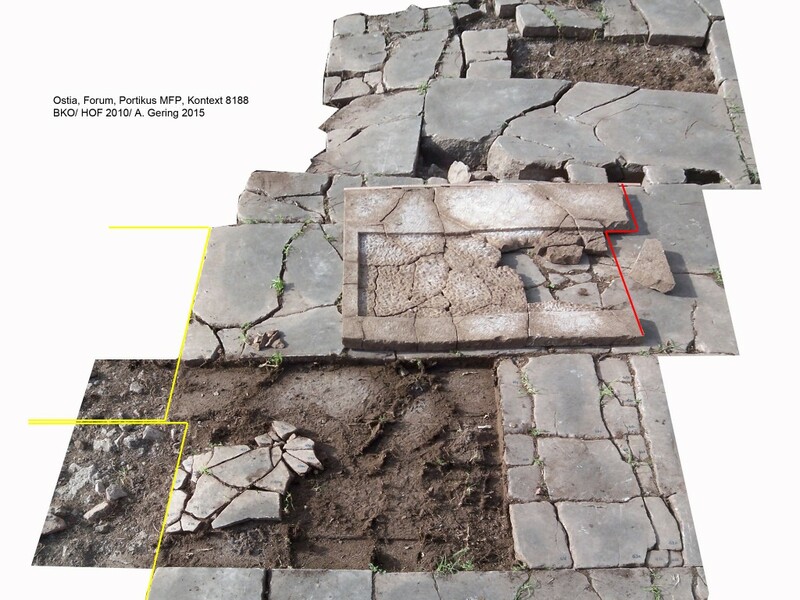 The tertiary cutting-processes of blocks from ‚standardized‘ half foot, one or two feet blocks, which were already „spolia“, into slabs with more specific dimensions, can be observed at the back-side of many pavement slabs, which were obviously reused and reworked a second time (see pictures below: The last pavement of the later 5th century AD at MFW shows, at the hidden back-side of these slabs, dowel-holes of their original function and lines of intended cutting). 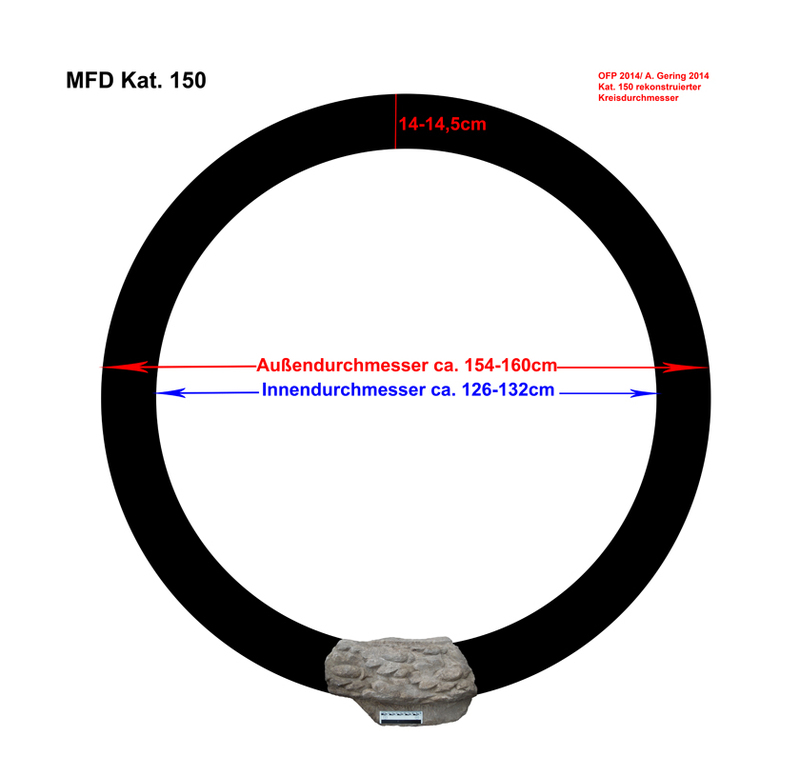 Our hypothesis regarding real „workshops“ in the area of MFD or TDV seems to be justified by the necessity of a certain infrastructure for „stone-saws“. 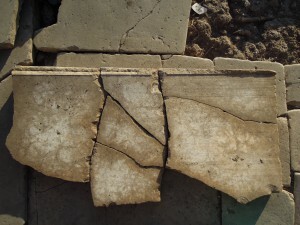 The process of „sawing“ is doubtlessly verified by the traces on the surface of many pavement slabs. As the famous Byzantine workshop found at the Embolos of Ephesos, we expect a fluent water supply, several water basins and enough space for the huge wooden-framework of a saw. However, the adaption of the „mass-produced“ slabs in specific dimensions with odd angles (see for example picture below: Yellow and red line) was not done in regular workshops, but rather directly at the building site itself as simple chisel-work. 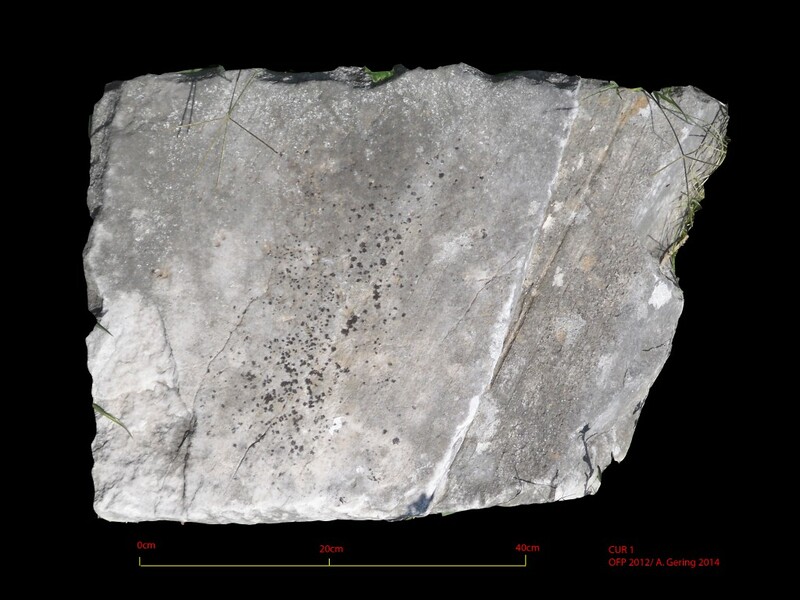 This can for example be verified at the latest pavement repairs in MFP, dated to the second half of the 5th century AD (see picture below), where the remaining cut-outs were used in the filling of the mortar bedding underneath. The obvious leftover from an „ad hoc“ cutting remained on site in situ next to its origin until we found this evidence back in 2010 (see picture below, compare older campaigns). The triangular cut-out itself seems a rather unimportant find, but it helps to fit in further puzzle-pieces in the overall picture of late antique reuse practise and everyday life in the last times of the antique city culture. One of the surprising finds in the fourth week of the campaign 2014 was a marble fragment with a quite specific decoration. 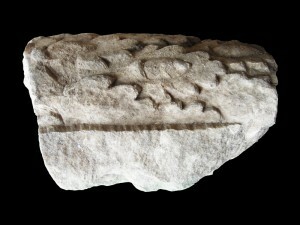 The fragment’s front-side consists of a rounded wreath decorated with oak leaves (see picture below: right bottom angle). The fragment’s back-side shows a quite regularely cut shape for further reworking processes (see picture below to the left). 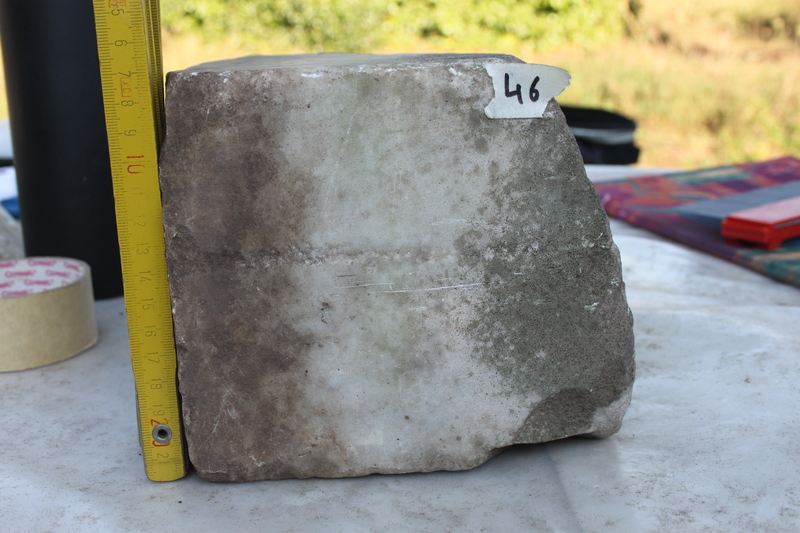 The dimensions of roughly 40 cm x 30 cm x 15 cm seem an average size for „big“ marble-blocks in our pile TDV (compare the half finished Corinthian capital in the picture above). The back-side is partially polished like other fragments from the pile (see picture below to the right). 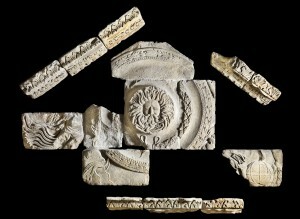 Could the fragment have been part of a frieze with a continuos row of half round garlands? The depth of the relief and especially the constant diametre of the wreath itself, which was neither increasing nor decreasing towards one of the sides, was rather unusual for this interpretation (compare pictures below). 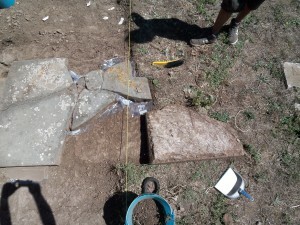 Soon we decided to measure the angle and reconstruct it as part of a full circle (see picture below). A wreath of oak leaves in form of a full circle was not unusual in Roman art, especially in Augustan times. 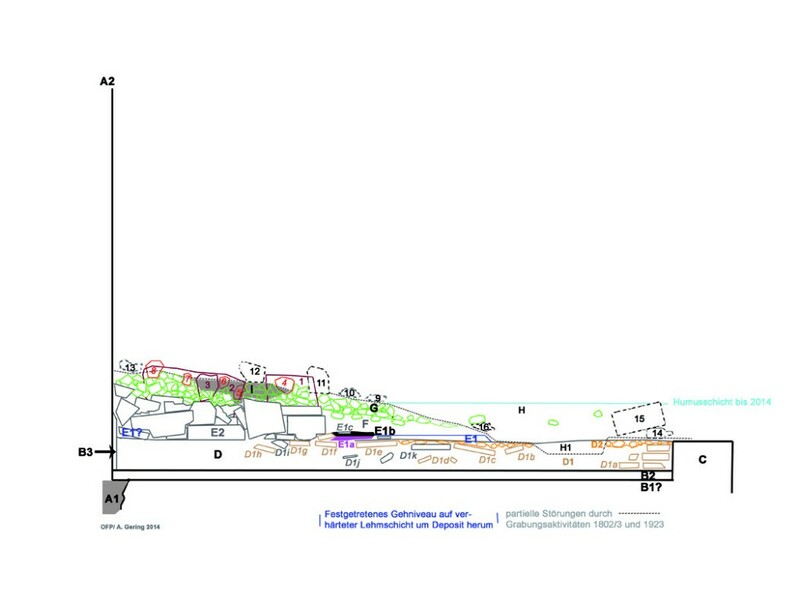 Reconstructing the circle‘s exact diametre by Auto-CAD offered a real surprise! With just a few centimetres of tolerance our oak-leaf wreath had a diametre of 160 cm (see picture above). This fitted exactly the dimensions of a tondo, which was reconstructed already in the 1960’ies inside the pediment of the Ostian Roma and Augustus temple or – regarding the proportions and postition – a similar example at Pula (see picture below)! The evidence of the old finds is broadly discussed in the wonderful 2013 book of Roberta Geremia-Nucci (see Geremia-Nucci 2013). The oak wreath is a central element of Augustus‘ Imperial narrative (compare pictures below). Hence, it would fit quite well into the proportions of the pediment of the Roma and Augustus temple (see picture below, based on the drawing of Italo Gismondi). However, another question remained: What was inside the circle? Could we reconstruct our oak wreath with an additional element, which Augustan coins frequently show (compare picture below)? Help comes from the well known shield from Arles in France resembling the famous original of the clipeus virtutis in Rome (see picture below). A shield alone can be attached to a wooden beam as the original probably did. The image of this shield from Arles still shows these construction-details (see picture above). However, in a pediment, the shield must be held by something different or somebody more attractive. Again, we can find some additional hints in Augustan coinage (see picture below). 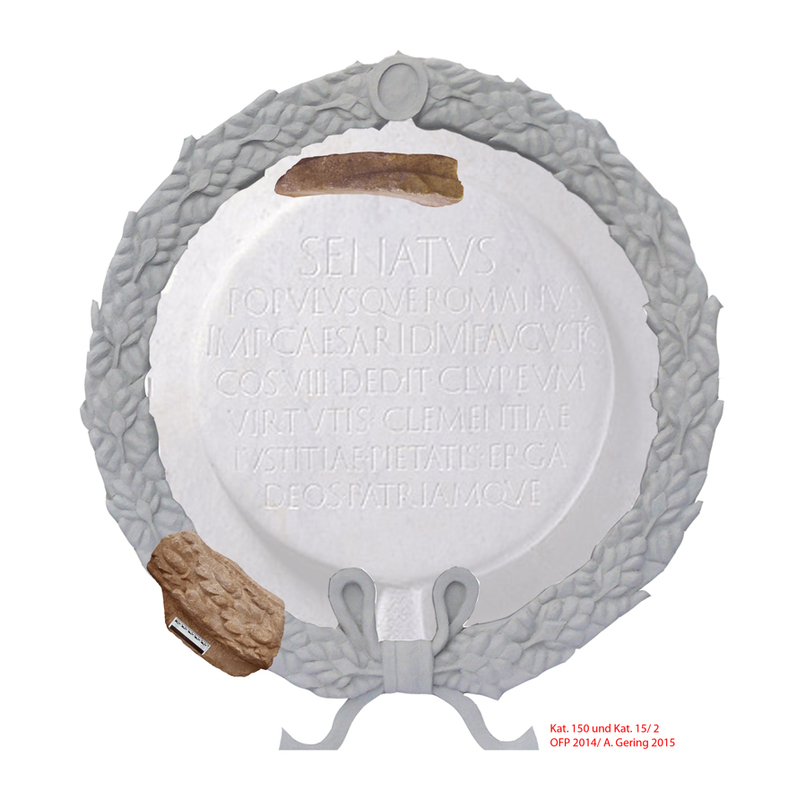 The motive of a Victoria holding the shield (see picture above) is also well known from a statue-fragment found during the old excavations of the Roma and Augustus temple at Ostia back in 1923 (see picture below: The 1923-Victoria to the right with additional 2014-fragments of their clothes to the left of the reconstructed tondo, compare again Roberta Geremia-Nucci 2013). 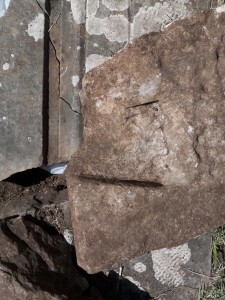 By further analysing the fragments from the marble pile TDV in the post-excavation work, another fragment, a reused repair-piece, seemed to fit in the shield itself (see picture below). Therefore, based on our finds of 2014 from the marble pile found back in 2012, we can reconstruct the middle of the pediment of the Roma and Augustus temple as proposed here (see picture below). Surely, this is still work-in-progress, so it is highly likely that many more fragments will enrich the evidence soon! Our new addition from the marble pile TDV, both are the coloured fragments in the shield reconstruction of 2015 (see picture above), seems fragmentary, but sufficient for the reconstruction. Unfortunately, nothing has yet been identified from a possible inscription inside the shield, as the Arles‘ marble-copy or Augustan coins show frequently. However, by their stylistic dating, our new wreath fits very well into the dating of the temple in Augustan times, contrary to the shield fragments found back in the 1960’ies, which hitherto have been used for the interpretation (compare Geremia-Nucci 2013 to the earlier research). 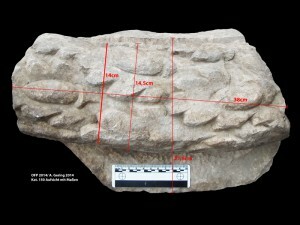 Our contribution to this well-dicussed evidence seems limited, but it has surprising consequences for the interpretation of the whole Forum, which culminates in the reconstruction of the complete pediment of the Roma and Augustus temple (see next chapter), and thus also a discovery of a previously unknown temple: The second shield of similar proportions from the old excavations in the 1960’ies needs to be reconstructed in a pediment too, quite obvioulsy in the context of a huge temple of similar proportions as the Roma and Augustus temple itself! 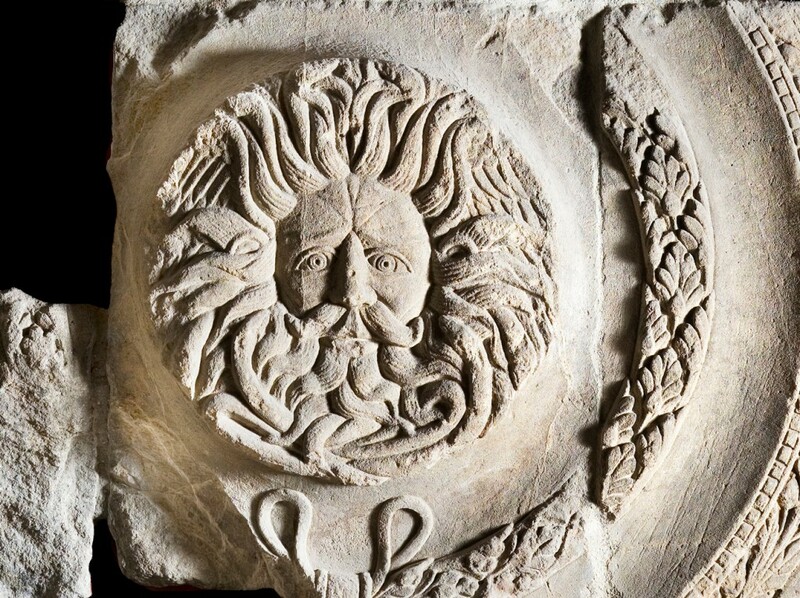 The image of the Victories holding the oak wreath with or without an included shield and inscription became obviously very popular in the first centuries AD. 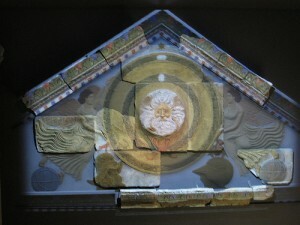 From the „high class“ Imperial art as our temple pediment (see pictures above) or its immediate predecessor in Rome itself (see picture below: The Palatine temple pediment with a tondo held by flanking Victoria-figures is visible in the background), this picture entered also the world of everyday decorations and „popular art“ (see second picture below). 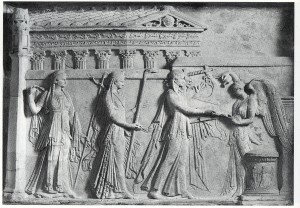 Sarcophags and loculus reliefs show, especially in Ostia, a broad reception of „official“ art into the self-representation of the so-called new „middle classes“ of (former) freedmen (liberti), which were the main clientel for the mass production of sarcophags and local funeral sculpture. Maybe the diffusion of the images can be observed not only „socially“ into the hierarchic Roman society, but also topografically from the centre (Rome and Ostia) to the margins of the Roman Empire. 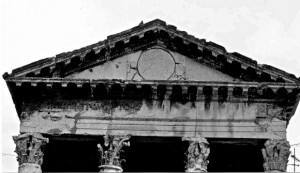 For example, other temples in the provinces seem to have been more or less directly influenced by the central motive with oak wreath held by two flanking Victories as well (see pictures below: Temple pediment of main temple in Baths, Great Britain, and its colour reconstruction. Pictures from the local museum). 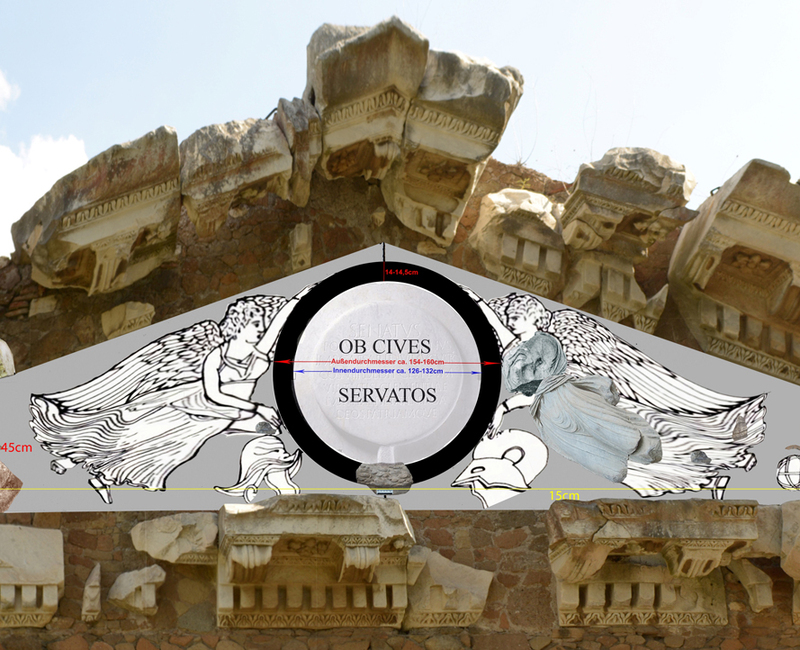 It seems worth noting that the dimensions and the proportions of the wreath at the Claudian temple in Baths are almost identical with our Ostian wreath fragment! Maybe popular images as we have found in Ostia (as the closest parallel to the Capital itself) were transmitted as detailed drawings to new temples dedicated to the „Imperial cult“, which were erected and decorated in many cities of the Roman empire. All our discoveries will be published in detail in the article: A. Gering, Brüche in der Stadtwahrnehmung: Bauten und Bildausstattung des Forums von Ostia im Wandel, in the book: A. Haug – P. Kreuz (editors), Stadtwahrnehmung in der römischen Kaiserzeit, which soon will be available. A more detailled analysis will follow in the forthcoming Römische Mitteilungen.